I dubbed this wedding photograph "The Last Sunset of 2014". New Year’s Eve is an extremely popular date to have a wedding celebration on. People are in party mode and what better way to ring in the new year than by attending a celebration of love with friends and family. This photograph was made at sunset on New Year’s Eve at Timber Point Country Club in Great River, NY. 2014 was fading away into a beautiful magenta and purple sunset on a mild winter’s night. 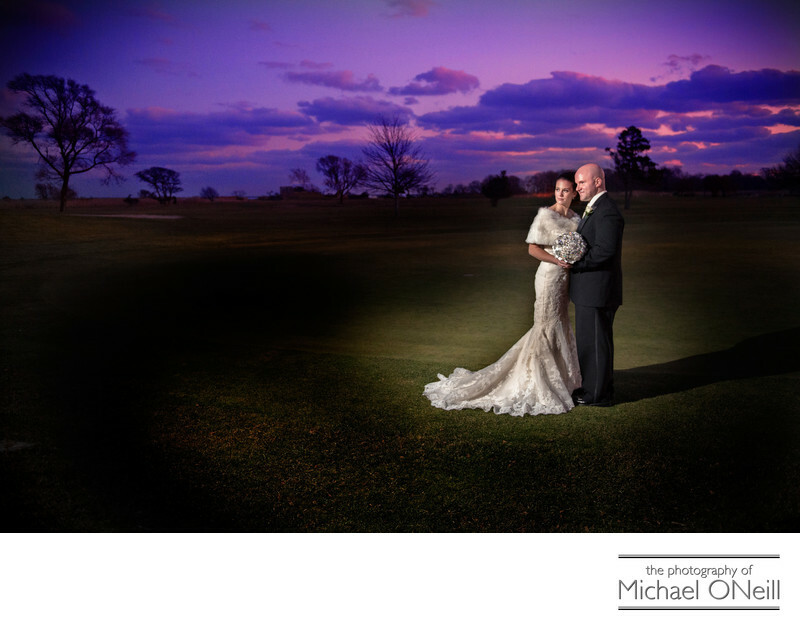 I brought my bride and groom out of the former manor house (which is now the venue for your elegant wedding celebration) and onto the golf course for this sunset wedding picture. Like other New Year’s Eve Weddings I have photographed the midnight hour is always special. At this event large screen television monitors were wheeled onto the dance floor and a direct network feed from Times Square in NYC was displayed. The crowd of wedding guests counted down into 2015 and the bride and groom shared their first New Year’s Eve kiss as husband and wife to the cheers and applause of their friends and family. Champagne was consumed, noisemakers sounded out and the guests partied into 2015 with the newlyweds.